Well, another festival is in the bag. Did 26 movies spread over 46 hours (with about 26 hours of standing in lines). General consensus seems to be that the new ticketing system worked well, and was a welcome improvement over previous years; credit to the technical team and TIFF for putting together a system that appears to have avoided many of the performance issues faced in the past. Most of the people that I saw mention issues around being able to log in or fulfill orders appear to have been able to call the box office and get their orders processed over the phone, and for the most part it seemed like issues were fixed relatively quickly without having to take down the whole site, which I know can be challenging if not impossible. The new ticketing system allowed you to see exactly what you were getting and to make your own changes in real-time, rather than having to go the voucher/exchange route. The ability to get the Flex package in 10-ticket increments was good for those of us picking large numbers of movies, and being able to get more than 1 ticket per screening in the My Choice packages helped in sharing packages amongst friends and family. The Premium package was a good replacement for the old Visa Screening Room packages or not being able to pick premium screenings in advance at all. The Festival started accepting other credit cards besides Visa. I liked the approach of having slides listing the sponsors before the movie, so that the programmers didn't have to go through the whole spiel before introducing the film; too bad they couldn't do that in all the screenings. Usual kudos to all the volunteers for helping to put on another good festival. Used tiffr.com again this year to help with planning, and as usual, it was a big help. The quantity showing 0 in dropdowns on the ticketing site; most people, including myself, assumed that meant the film was off-sale, when that might actually not have been the case. While there's probably nothing technical that could be done to get around that, a bit more information would probably help. On that note, it would have been nice to have more information around the new ticketing system overall prior to logging in, to relieve a lot of the uncertainty everyone had with the new approach. Thanks to blogs like In a TIFF http://inatiff.com/ and commenters like mathew5000 for providing early information and tips on the process; it definitely helped me plan out my session! And I think people liked the screenshots I was able to post after my picks were done. Even if it's on a secondary FAQ page, more information, not less, would be helpful especially to all those festival die-hards who are also the people most likely to gripe and complain (myself included). The whole virtual waiting room concept needs a bit more work, especially since it's not actually first-come-first-serve, and the text on the screen really doesn't help those poor souls that actually believe the timer is counting down to when they'll be let in. It would have been extremely helpful to have a public listing of off-sale films, so people can plan out their schedules before their selection windows, especially given the time limit. Only seeing availability once you've logged in doesn't give you much time to hunt around for backups unless you're really prepared. Given the fact that everything is online and connected, it would seem this would be more achievable now than in past years. Thanks, though, to all the commenters who were good enough to post off-sale screenings after their picks, to help those who would come later. A few people seemed not to have realized that the back-half and daytime packs had selection windows after tickets went on sale to the general public. While the dates were visible on the site, if you were only looking for a daytime pack, it would be easy to miss the fact that you'd be picking after everyone else. It would have been better to make that clear on the site when purchasing packages. More detail was needed earlier on how the pricing of the Flex Package broke down (e.g. if you wanted to buy 60 tickets, it wasn't clear in advance how much that would actually cost). It should also have been clearer exactly how many My Choice regular/premium or TIFF Choice packages you could buy in one transaction. There also needed to be more details on the times for ticket selection windows for the different TIFF member levels and the public. Dates alone are never sufficient. Definitely could've used a bit more variety in the trailers this year; by the end I had all the dialog from the L'Oreal trailer memorized (I did end up looking up exactly what a key light is in cinema :-)). The Midnight Madness crowd had a good way of dealing with all this. On a side note, people have commented on how it seems like every year there's less and less morning screenings. Out of curiosity, I ran the numbers, and in 2003, there were 79 screenings that started before 12:00 PM. In 2012, there were 85, but there's also one extra day that didn't exist in 2003. More interestingly, if you ignore weekends, 2003 had 55 morning screenings, but in 2012 there were only 19. So if you're wondering why it's harder and harder to see 50+ films in a year, there's one answer for you. Rust and Bone: I've never been particularly fond of Marion Cotillard in English, but I really liked her in this film. And the special effects were pretty amazing, as anyone who has seen this film could attest to; I'm still not entirely sure how they did it all. Imogene: a really entertaining and endearing film, if a bit goofy in places, but Kristen Wiig gives a more grounded performance, which helps. The Place Beyond the Pines: while I didn't necessarily like this as much as Blue Valentine, I thought there was some strong acting from Ryan Gosling and Bradley Cooper and some surprises in the film. A Liar's Autobiography: interesting approach to use animation to illustrate the tapes Graham Chapman made before his death, but it felt like the movie lagged in places, especially towards the end. As the directors pointed out, this is *not* a Monty Python film, and you'd do well to keep that in mind if you're planning on seeing it. How To Make Money Selling Drugs: slyly starts out styled like an infomercial, but eventually reveals the social, financial, and criminal impact of the war on drugs and posits different solutions to a seemingly intractable problem. Love Is All You Need: enjoyable, much lighter than some of Bier's other films; given the setting, plot, and the casting of Pierce Brosnan, I'm tempted to describe this as Mamma Mia with less singing and more cancer, but that trivializes lead actress Trine Dyrholm's fine performance. At Any Price: found Dennis Quaid's character almost too fake and superficial in the first half of the film, but it provides a sharp contrast with his true self revealed in the latter half. Antiviral: very stylish, reminiscent of elements of director Brandon Cronenberg's father's work, but I think he still made it his own. Fascinating speculation/satire on how far we might actually take celebrity worship. Nice touch with the voice cameos from Ben Mulroney and Tanya Kim. Tai Chi 0: entertaining, action-packed, and funny, made me want to see the next film in the series. In Conversation with Jackie Chan: consensus in the crowd seemed to be that it might have been better to get someone like Colin Geddes to moderate this one. The Chris Tucker cameo was nice surprise (and nicer still they got him off quickly), and the trailers and featurettes shown for his new film made me want to see it. There wasn't much time for audience Q&A so it felt rushed, but in any case there were way too many people with personal pleas/comments as opposed to questions, which was frustrating and uncomfortable at times. Storm Surfers 3D: almost made me want to take up surfing, at least up until the point where Tom Carroll gets slammed by a wave and almost drowns. As a plus, the directors got Ross Clarke-Jones on the phone during the Q&A. Key of Life: one of my favourites, a really entertaining, funny, and well-constructed story. Ghost Graduation: another favourite, it's the Sixth Sense crossed with The Breakfast Club. While not necessarily the most original story, the way it's put together and the actors themselves all combine to make something satisfying. Imagine: a rather soft and quiet film, it is actually quite effective at putting you in the shoes of the blind, allowing you to experience the world as the lead character senses and describes it, without giving anything away visually. Smashed: short but sweet, Mary Elizabeth Winstead gives a very good performance as an alcoholic school teacher who finally realizes she has a problem. Also helped by Aaron Paul and Nick Offerman in a more dramatic turn. Passion: this is not a subtle film by any stretch of the imagination, and the style is laid on quite thick in the last third of the film compared to some of his other work, more than I would have liked. But as De Palma said in the Q & A, he wanted to visually portray the mind of Noomi Rapace's character as well as find a different take on scenes that have been done to death in other films and TV, and he definitely succeeded on that front. I did like Rachel McAdams playing a manipulative character and not the wide-eyed innocent. Much Ado About Nothing: I thought it was a great adaptation, although the modern setting with the original dialog took me a bit to get used to at first. But the film definitely won me over, and I especially enjoyed the rapport between Alexis Denisof as Benedick and Amy Acker as Beatrice. The rest of the cast was good as well, including Reed Diamond, Clark Gregg and Fran Kranz. And I can't forget Nathan Filion (it would've been funny if Stana Katic somehow showed up while Filion was interrogating the villains of the piece). Blancanieves: very much a dark fairy tale of a young girl with no end of misfortune in her life. And I barely recognized Maribel Verdu as the evil Encarna. The Thieves: a stylish heist movie, with a great action set piece on the side of a building. This film is interesting in that it essentially changes focus on who the main characters are midway, asking you to shift your allegiances and sympathies, which is a bit confusing and disconcerting. Laurence Anyways: intriguing film, though going in I thought the running time would be a problem, especially after reading reviews, but I found it didn't bother me and helped to fill out the main character's journey. Thale: seems like it may have come from, or could have been, a short film; it's like a Scandinavian fairy tale of sorts. Room 237: kind of engrossing film, with some really interesting theories about hidden meaning in The Shining, although there are many points that seem to be a stretch. The film never takes sides or provides an opinion, it just provides an non-judgmental forum for people to air their thoughts. I thought the most interesting ones were simultaneously running two copies of the film over one another (one playing forwards and the other backwards, revealing some startling coincidences), and the various long dissolves of one scene into another. Motorway; not a bad action film, with some innovations, but also some cliché plot elements, and a number of chase scenes were difficult to see because they were shot in close up or in the dark. Screening with the most celebrity wattage: was a bit sparse this year because of the screenings I picked, but probably Imogene wins with Kristen Wiig, Darren Criss, and Natasha Lyonne. Honourable mention to In Conversation With Jackie Chan just because of who he is (plus the surprise cameo by Chris Tucker), and to Passion, just because Brian De Palma showed up to do a Q&A even though the screening was in the back-half of the festival. The team, or at least part of it, from NPR's Pop Culture Happy Hour (of which I am an avid listener) made the trek to TIFF this year and posted a number of reviews, and even did their regular podcast by borrowing a studio from the CBC. Have a listen for their take on TIFF and Canadian culture in general. Imogene features Kristen Wiig as the titular Imogene, a once-promising playwright who has let her talents lie fallow in favour of whiling away time with her high society friends and boyfriend in New York City. A series of events causes her to hit a nadir in her life, which leads her back to her dysfunctional family in New Jersey, headed up by her larger-than-life mother, played with gusto by Annette Bening. This was a warm and funny film, never failing to get a laugh out of the audience at the premiere. While the characters all had their eccentricities, the film still felt grounded and relatable, and both Wiig and Bening give really good performances. Well worth seeing, and there still appear to be tickets available for the Saturday, September 8 showing. Bening and co-star Matt Dillon were unable to appear at the premiere because of conflicts, but are trying to make it in for subsequent screenings. Wiig, directors Robert Pulcini and Shari Springer Berman, screenwriter Michelle Morgan, and much of the rest of the cast including Darren Criss did make it to the premiere. The weekend of September 8 and 9, 2012, there is no subway service between Union Station and St. Andrew Station. This may affect you if you are trying to go between TIFF Bell Lightbox/Scotiabank/Roy Thomson Hall/Princess of Wales and Elgin/Yonge & Dundas, or trying to get to TIFF Bell Lightbox/Scotiabank/Roy Thomson Hall coming south on the Yonge line. Get off at stations on the Yonge line and walk or take a streetcar over to the University line. Sunday to Friday, after about 12:20 AM or so (until December 2013), subway service stops between Eglinton and Finch stations on the Yonge line. Bus service replaces it during this period. This may affect you if you are seeing a Midnight Madness film. Subway service on Sundays starts later than on other days. For example, the first train leaves Finch at 8:57 AM on Sunday, as opposed to 5:57 AM every other day. Note this if you have a 9:00 AM screening. 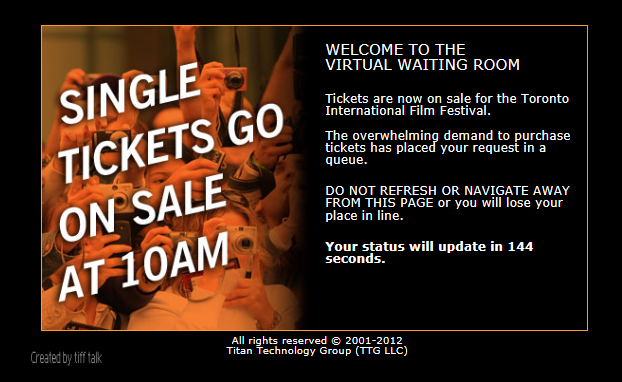 If you are purchasing individual tickets for TIFF 2012, you may first get shunted to a virtual waiting room if the load on the system is high. Note that the countdown timer refers to when the page will automatically refresh, not necessarily when you will be let in; the counter may simply reset to a new number (and that number is pretty random, on refresh I've seen new times anywhere from a few hundred seconds to over 2,000). You may also want to try opening multiple browser windows or tabs as well; I was let in on one that wasn't the very first one I opened. The tickets will be placed in your shopping cart. Note the timer at the top of the screen. Once you pick your first screening, you have 30 minutes to check out. I'd recommend you leave time to actually complete the payment process within that time limit. If you want to pick by title, you'll get a screen where you can click a letter of the alphabet and see all films starting with that letter. Note that in the My Choice ticketing process, people had more luck (i.e. less errors) using the By Schedule view. 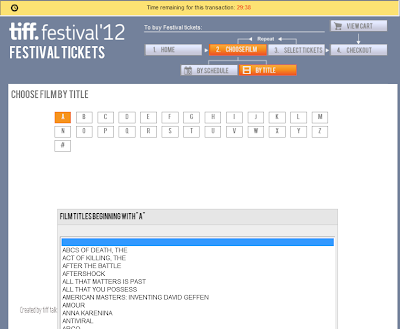 If you click a title, at the bottom of the page you will see all the screenings for that film. Click the one you want to see, and then you will be directed to the quantity page as shown previously. If you encounter a server error any time during the process, it appears that some people have had success refreshing their browser; your shopping cart may need to be refilled after doing this however. Note, do this at your own risk as it's also possible you could get booted back to the virtual waiting room if past experience is any guide. You could also try calling TIFF customer service, but it's unlikely you'll be able to get through to anyone as the phone lines will likely be busy with people trying to phone in their orders. I ran into an error once while I was online, and I had to refresh about 3 times before it took me back into the site, but other than that there were no problems. If a screening is marked off-sale, it is sold out. However, some people have reported checking back on the film before they checked out of the site, and a previously off-sale film had appeared back on-sale, so you may want to double-check. If you get shunted into the virtual waiting room, note that when the countdown timer reaches 0, it will not necessarily let you into the site; it may simply refresh the counter. The site will redirect your window automatically to the ticketing site when a slot open; this will not necessarily occur when a counter reaches 0, so keep a close eye on your browser. Try opening multiple browser windows; you will get a different refresh count for each, and I had one of the windows let me in eventually (and not necessarily the first I opened). The actual site is similar in appearance to that for the My Choice packages. Note once you pick your first ticket, you have 30 minutes to check out. Sunday, September 2: At 10:00 AM, single tickets go on sale. Anyone can purchase individual tickets to screenings at this point. Monday, September 3: People who have purchased Back-Half or Daytime ticket packages can go in and select their screenings. Selections can be made up until September 5 at 7:00 PM. Tuesday, September 4: Ticket package holders can go to the Festival Box Office (or the appropriate member box office for TIFF Members) to pick up their tickets. Note that if you aren't making any exchanges (on My Choice packages), then there's no point to showing up first thing when the box office opens; you should probably wait until the crowds die down. TIFF Choice package holders should have already received an e-mail outlining their scheduled screenings. If you want to know what screenings are sold out, check out the official TIFF off-sale page at http://tiff.net/offsale, or check out the page http://tifftalk.blogspot.ca/2012/08/tiff-2012-sold-out-screenings.html in this blog. When picking up tickets, don't forget to print out any confirmation e-mails, and to bring along the credit card you used to purchase your tickets/packages, and government-issued ID. Antiviral (Brandon Cronenberg, Canada): interested to see how his style compares to that of his father. At Any Price (Ramin Bahrani, USA): with Dennis Quaid, Zac Effron, and Heather Graham. My friend really liked Goodbye Solo, another of Bahrani's films. Ghost Graduation (Javier Ruiz Caldera): this one sounds fun. How to Make Money Selling Drugs (Matthew Cooke, USA): sounds interesting, and where else are you going to find Susan Sarandon in the same film as 50 Cent? Imogene (Robert Pulcini, Shari Springer Berman, USA): with Kristen Wiig, Annette Bening, and Matt Dillon. In Conversation With... Jackie Chan: couldn't pass this one up. Laurence Anyways (Xavier Dolan, Canada/France): saw Dolan's last film, Heartbeats, at the festival. A Liar's Autobiography - The Untrue Story of Monty Python's Graham Chapman (Ben Timlett, Bill Jones, Jeff Simpson, United Kingdom): can't believe it's been 23 years since Chapman died. Tai Chi 0 (Stephen Fung, Hong Kong): the director of Gen-X Cops and fight choreography by Sammo Hung? Sure, why not! If you bought a My Choice ticket package for TIFF 2012, then you will be able to select your films ahead of the actual festival. This page describes the process for selecting those films. 1. First, decide on which films you want to see, and when you want to see them. Make a list of the films and times and sort by date and then name. If you are selecting tickets for more than just yourself, then also note the number of tickets you want for each screening. This will make it faster to select your films. You may also want to note any backup choices in case your first choice is sold out. 2. 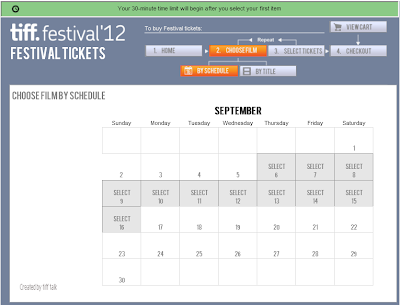 Check the e-mail you received from TIFF with your start time. 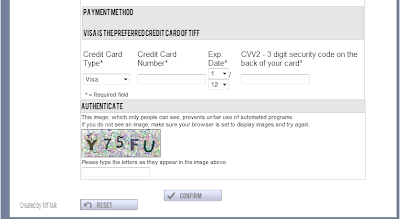 If you did not receive an e-mail, then contact TIFF customer service. 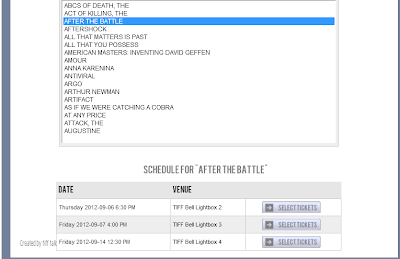 On or after your start time, go to http://tiff.net/gettickets/packageticketselection. 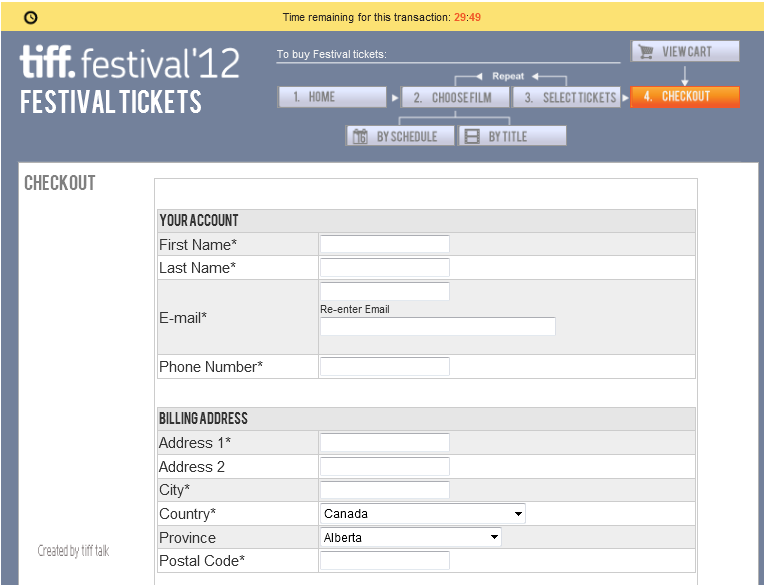 If you do not have access to a computer, then you can call or visit the Festival Box Office to make your selections on or after your start time. Enter the e-mail address and the password you set up when you purchased your ticket package, along with the Package Code that was in your e-mail. If you received more than one Package Code, then you must complete each package one-at-a-time. Note that if you did not purchase all your packages in one transaction, then you may receive different start times for each package. If the start time for your package has not yet arrived, the site will alert you that your e-mail address, password, and package code are correct, but that you cannot sign in yet. If you continue to get this message even after your start time, then contact TIFF customer service. Note the instructions on the screen. Once you select your first screening, you will have 60 minutes to complete your selections and checkout. If you fail to checkout before the 60 minutes are up, your order will be cancelled out, and you will receive vouchers instead of your selected screenings. If you checkout but don't pick all your screenings, you will receive vouchers for the remaining tickets. Note once you checkout and then log out of the system, you will not be able to re-enter with that package code. You must make all your selections in one shot. 4. Now you can begin to select your films. You can search for films by schedule (i.e. by date), or by title. People have generally reported more success with searching by schedule. Click on the day of the screening you want to see. In this case, we will click on Friday, September 7. 5. You will now see a listing of all the films on that day, along with the time of the screening. 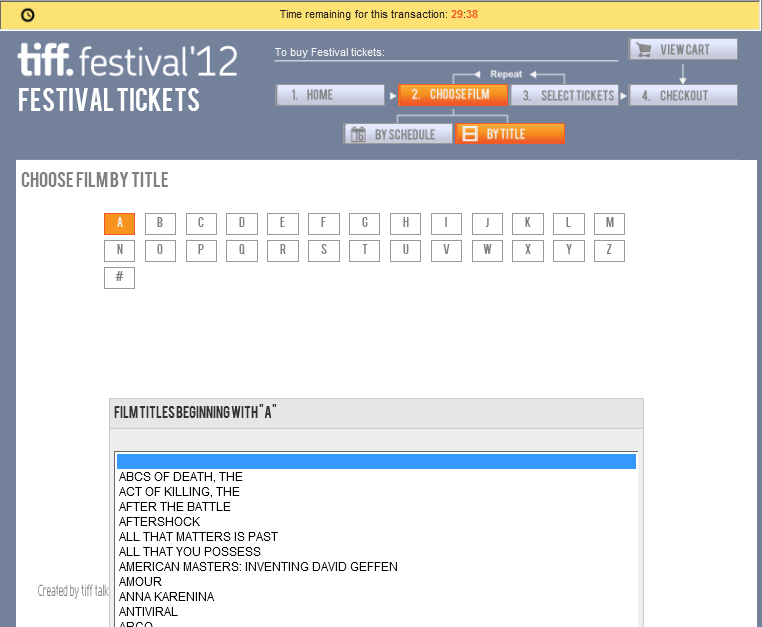 If a particular screening is sold out, it will be marked as such instead of showing the time of the screening. In the image below, The Brass Teapot has been marked off sale and cannot be selected. 6. 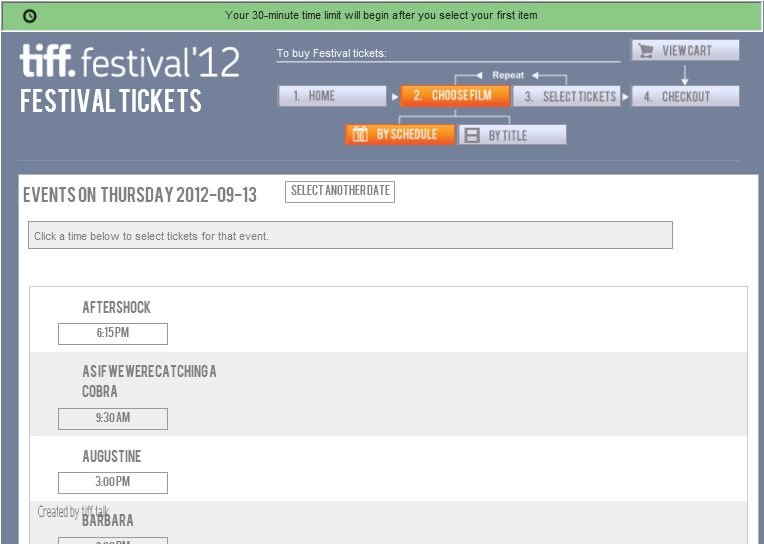 Scroll to the screening you desire and click the time. Here, we are picking Rust and Bone at 12:00 PM. 7. You will be taken to a window where you can select the number of tickets you want to use. If the dropdown is empty or only has a 0, then click the By Schedule button at the top of the screen and try again, or make one of your other choices first and then try the original film again. 8. 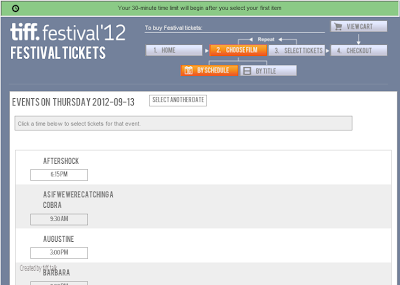 Once you have selected your quantity of tickets, click the Add To Cart button at the bottom of the page. This will take you to your shopping cart where you can see your selections. 9. Repeat steps 4 to 8 for the remaining tickets in your package. You can check the total at the bottom of your shopping cart to see if you've used all your tickets yet. Also keep an eye on the timer at the top of the page. Most people have completed their orders in under 30 minutes, but if a lot of your screenings are sold out and you end up searching for backups, you could eat up time quickly. TIFF recommends that you checkout before the timer gets to 5:00 remaining. 10. 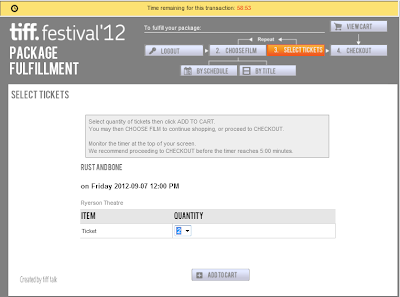 Once you have used all your tickets, click the Checkout button at the top of the page. The Checkout screen should already show your first name and last name. Re-enter your Package Code in the indicated field, and then click the Continue button. 11. On the confirmation screen, do one final check to make sure your screening selections are correct and that you've used up the proper number of tickets. If everything is ok, then click the "Yes, I have completed my package ticket selections" box and click the Submit button. 12. You should then see a Order Complete screen. Note the reservation number for your records. You will also receive this number in a confirmation e-mail, but it's probably a good idea to note it in case you don't get the e-mail. 13. You can pick up your tickets starting September 4 at the Festival Box Office at Metro Centre. You will need a print out of your confirmation e-mail, the credit card you used to purchase your package, and government-issued ID. TIFF Members can pick up their tickets at the Member Box Office or the Bell Lightbox (the latter only for Patrons Circle Members). If you encounter any error messages while filling out your order online, try clicking the By Schedule or By Title buttons; do not try to logout. I got an error once, but I just clicked on the By Schedule button and was able to continue on; my session was still active and my shopping cart still had all my selections. This post is a placeholder for people to add comments for any films that they notice as sold out when completing the online ticketing process for My Choice packages for TIFF 2012. Feel free to post a comment for anything you see as sold out when you log in to make your picks to help others out. On Twitter, appears people have been generally having favourable experiences with the new online system for picking tickets for the My Choice packages. One person mentioned an issue with quantities not showing up in a dropdown, but they said something about switching from alpha to date selection solved the problem. I'll post more information once I've had a chance to go through the system myself. 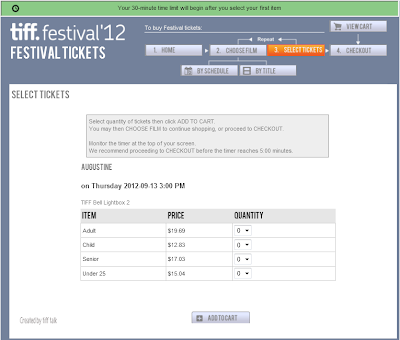 Update (2012/08/25 8:48 AM): Check out In a TIFF for a description of the online ticketing process and some tips. Update (2012/08/25 9:02 AM): Check out matthew5000's comment for more info on the process. The list of actors, directors, and others attending or expected to attend the festival has been announced. The full list can be found here. Today, August 20, 2012, TIFF sent out notifications of the ticket selection windows for anyone who purchased a My Choice ticket package. If you didn't receive a notification by e-mail, I suggest you check your junk mail folder or contact TIFF customer support if you really didn't get anything, but do it before August 23. Starting August 21, the official film schedule will be released, which lists all the movies at this year's festival, and the dates and times at which the movies will be shown. You can view the schedule online, or pick up a paper copy at the Festival Box Office. If you purchased a Programme Book, you should also be able to pick it up starting on the 21st. For TIFF Members, ticket selection will occur between August 23 and August 26. For non-TIFF Members, ticket selection will occur between August 26 and August 29. Your actual start time will have been e-mailed to you. Note that if you bought a Back Half or Daytime package, your ticket window will actually occur sometime between September 3 and 5. If you bought multiple packages, you apparently will receive a separate login for each package. However, if you bought all your packages in the same transaction, you will get the same start time for all of them, but you may still have to login separately for each one. 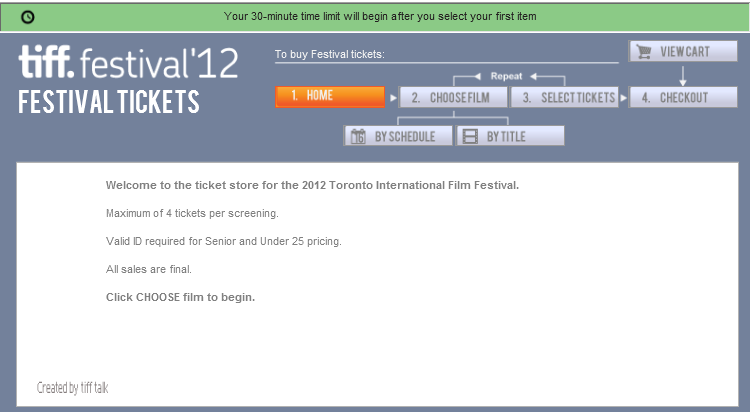 You can make your selections online at the TIFF website anytime between your allotted start time and 7:00 PM on August 29. If you fail to make your selections by the 29th, then you must wait until 10:00 AM on September 3. You have from then until 7:00 PM on September 5. If you still fail to make your selections within that second period, after that you'll get vouchers that you can redeem for tickets, but you'll have to line up at the box office in person to do so. 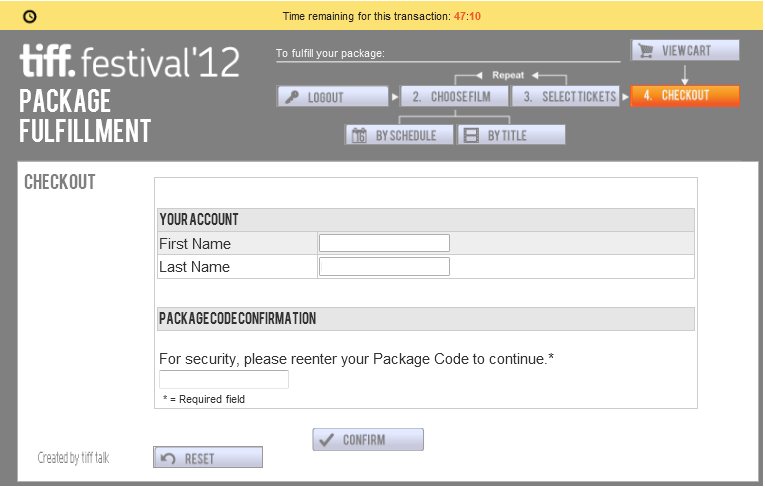 If you don't have a computer to make your selections online, you can go to the Festival Box Office starting at your allotted time and the staff will assist you. When you log into the site to make your selections, you must pick all your films in that session. You cannot make some of your selections, log out, and then log in again at a later date to finish. Once you log in, best information at this point indicates you may only have one hour to complete your selections, so plan your picks ahead of time. For example, if you bought a 60-pack, you would have to select one film on average every minute to complete on time. Note that if you get a start time of say 8:00 AM on August 27, you don't have to log in at that very moment. You can login anytime from that start time until 7:00 PM on August 29. Whenever you do log in, you will have one hour to make your picks. If you fail to make all your picks within your session, you will receive vouchers for the remaining films, which you can redeem at the Festival Box Office starting September 4. Since you have a limited amount of time to select your screenings, plan your choices in advance. The full schedule will be available starting August 21, so you'll likely have a few days to plan out the films you want to see before your window opens. Pick multiple backup choices in case your first choice is already sold out, especially if you are picking screenings likely to be more popular (e.g. ones with a famous cast or a lot of buzz). You may not have enough time available to pick an alternate on the fly. The site may not prevent you from selecting conflicting screenings, so the onus is on you to make sure your screenings do not overlap. Don't forget to leave time to get from one film to another, and don't forget to account for the fact screenings may start late or run long with Q&A sessions (i.e. avoid scheduling movies within 30 minutes of one another unless they are in the same theatre, as you'll likely never make it). A reminder, ticket packages for TIFF 2012 go on sale for all payment methods (Amex, Visa, MasterCard, debit, cash) tomorrow, Monday, July 9, 2012 at 10:00 AM Eastern time. 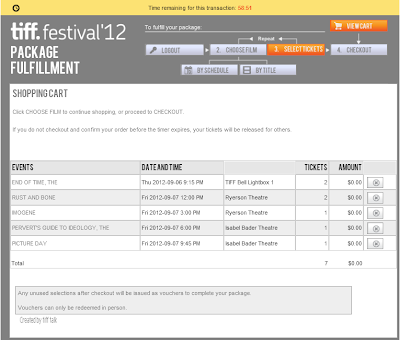 You do *not* have to be a TIFF member to purchase a ticket package. Online is probably be your best bet. The Premium Ticket Pack was sold out after the first day of sales to TIFF members and after the first day of sales to Visa cardholders,, but check back on Monday just in case. 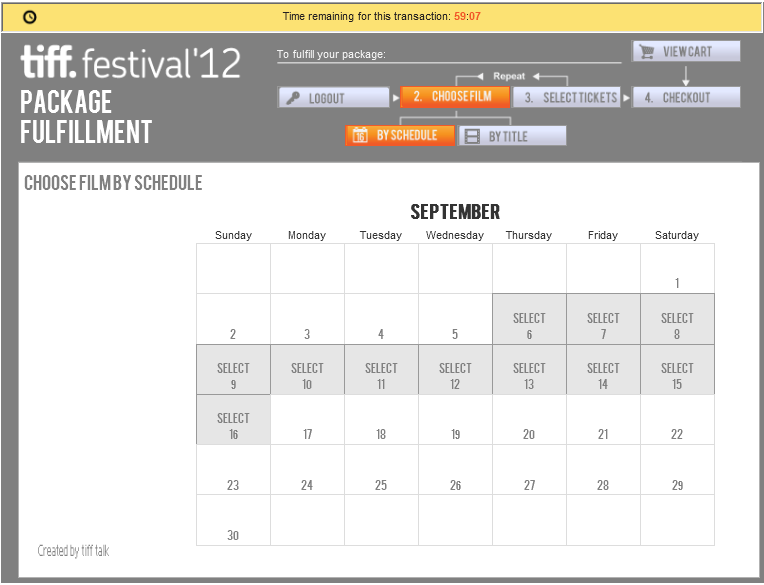 A reminder, ticket packages for TIFF 2012 go on sale to Visa cardholders tomorrow, Tuesday, July 3, 2012 at 10:00 AM Eastern time. 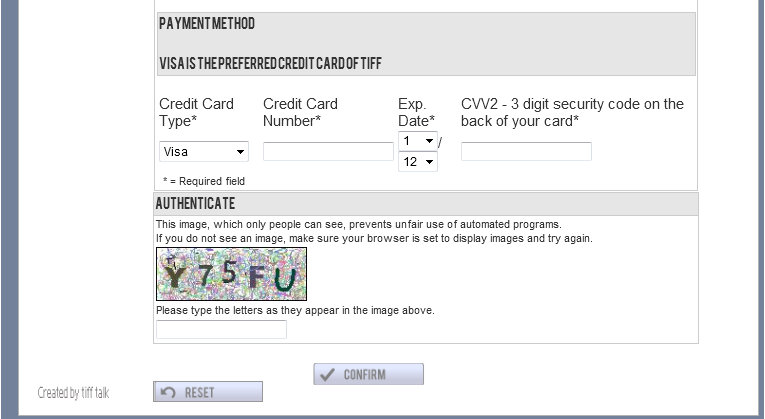 You do *not* have to be a TIFF member to purchase a ticket package starting July 3, but you must pay by Visa. If you do not have a Visa card, then you must wait until July 9, 2012 before you can purchase ticket packages by Visa, MasterCard, Amex, cash, and debit. Online would probably be your best bet provided the site doesn't have any issues. The Premium Ticket Pack was sold out after the first day of sales to TIFF members, but there may be additional ones available on July 3. The site didn't go down, and didn't seem to have any noticeable performance issues from what I saw or from what I can divine from Twitter. That's encouraging, although we'll have to see how it holds up during advance ticket selection and individual ticket availability. There were however, a few errors. The first was a validation error on Province if you were from outside Canada or the US, but TIFF got it fixed fairly quickly without having to take the site down. Another problem that some people including myself saw, was an error message if you tried to buy a Programme Book with a ticket package. I got around that by doing two separate transactions, one for each. If you want to pick the first item in the list of things to purchase (i.e. the Festival Programme Book), you may have to click something else in the list then re-click the book to get it to select the item. Didn't see any other mentions of problems, so hopefully that bodes well for the future. The My Choice Premium Ticket Pack is off sale (i.e. sold out) as of 6:46 PM on June 25, 2012. I don't know if any more will become available when public sales start, so keep checking if you're interested in that one, but otherwise you may be out of luck. The TIFF Choice Premium Sampler is still available. Packages are now on sale to TIFF Members (if you're not a TIFF Member, you can buy ticket packages starting on July 3 if you have a Visa card, July 9 for all payment methods). One thing to note; you may get an error if you try to buy a programme book with a ticket package. If this happens to you, buy each one in a separate transaction; i.e. complete one transaction with your packages, and a separate one for your programme book. Right now for TIFF Members, all payment methods are accepted (Visa, MasterCard, Amex). The online ticketing system will be down for maintenance between 1:00 AM and 4:00 AM each night, but other than that, you can select your tickets (for My Choice packages) anytime after your scheduled start time (and before the end of your advance ticketing period). Each account/membership can purchase 1 Premium flex pack (which is either 6 or 12 tickets) and/or up to 4 TIFF Choice packs. Ticket exchanges can be made starting on September 4, 2012 and up to 7:00 PM the day before the screening. There is no fee for exchanges on screenings in packages, and a $2.50 fee for single ticket exchanges (regardless of whether you are a TIFF member). MasterCard and American Express are now accepted as payment methods. There is an advance purchase window for Visa cardholders (for ticket packages) because Visa is a major sponsor of the festival. I've added a diagram of the ticketing process and dates to the Important Dates page, but the diagram is included below. You may have to save it locally to your computer to view it in its entirety. 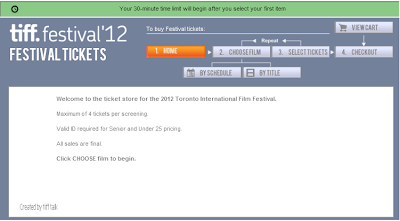 One clarification; it appears that everyone (TIFF Members or otherwise) have until August 29, 2012 at 7:00 PM to complete selection for the main My Choice packages. 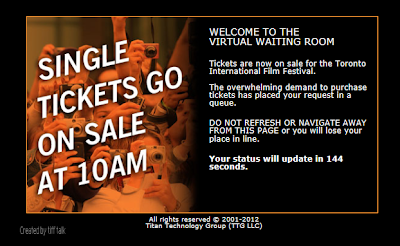 Although if you are a TIFF Member, there would be no point in waiting that long. 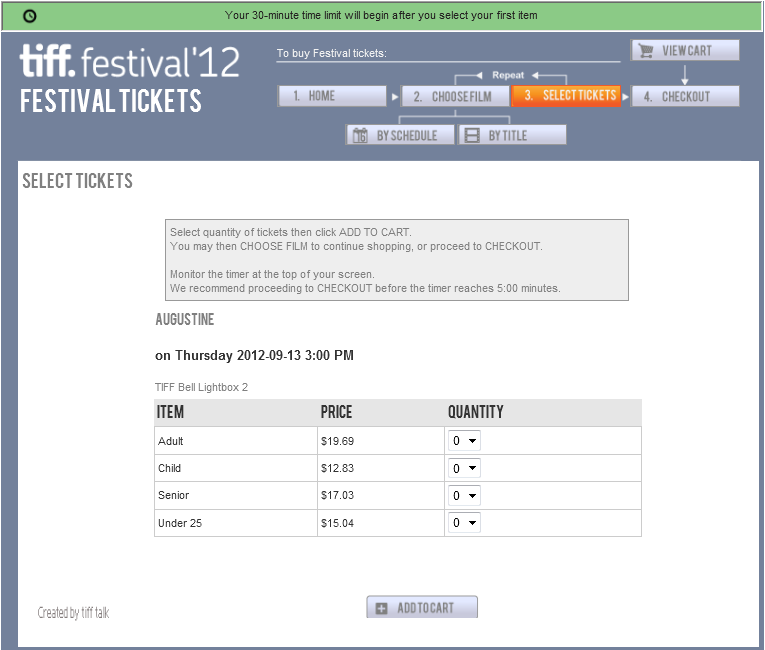 What Tickets Should I Buy for TIFF? Recently, in talking to some people who had never been to the festival before, it seemed like it might be a good idea to provide some suggestions as to what types of tickets or ticket packages you might want to buy for TIFF 2012. If you've never been to the festival before, your best bet might be to just buy a couple of individual tickets once they go on sale to the general public on September 2. I wouldn't worry about trying to figure out how the advance ticketing system works, or buying a membership, or anything like that, as that's just too complicated if you've never been and want to ease into things. 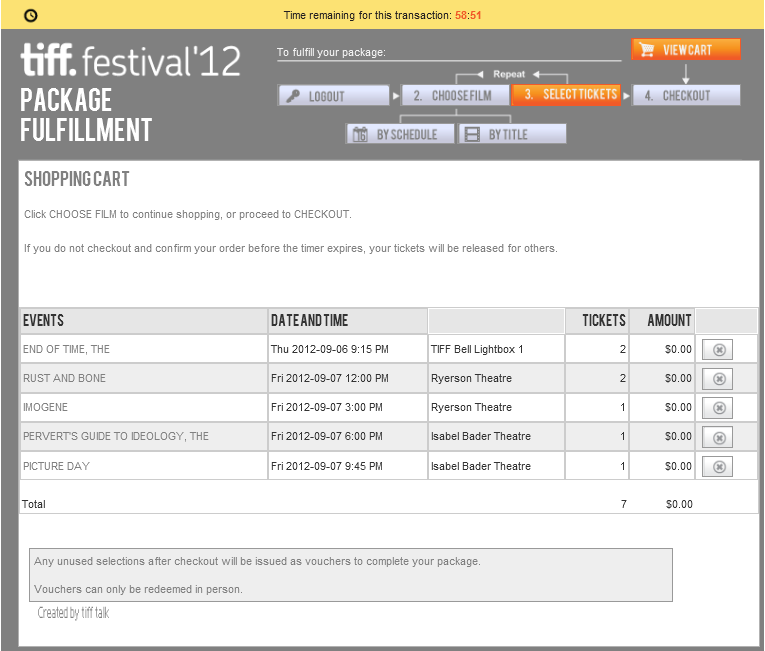 If you've gone that route and want to branch out a bit more, then consider buying one of the TIFF Choice packages. A good choice would be the Contemporary World Cinema package, the Daytime Sampler package, or the Evening & Weekend Sampler package. 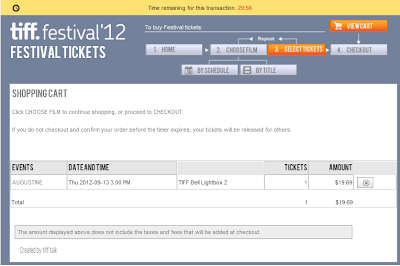 Once again, you don't have to worry about the advance ticketing process, since TIFF will pick films for you. Just buy the package, and wait for TIFF to tell you what movies you got. The Evening & Weekend Sampler package is the best choice for anyone who works during the day. Now, if you've done the above a few times and want to start delving deeper into the festival, you can look at the My Choice packages. These are good if you want to see a larger number of films, and/or you want more control over what movies you see, and/or you want to select films before individual tickets go on sale to the general public. If just starting out, your best bets would be the 10-Ticket Pack (you get to pick any combination of films, with up to 4 tickets per screening), or the 6-Premium-Ticket Pack (if you want to see bigger galas with bigger stars). That's basically the route I took over the years. I'm at the point now where I usually take vacation for the festival and see about 25 films on average (which is not a lot compared to some of the diehards - there's a fairly sizeable contingent of people who see at least 50 films every year). Feel free to post questions in the comments; I'll be happy to try and answer the best I can (which is a bit tougher this year since they've completely changed the system). I've updated the Important Dates page with more detailed breakdowns of what happens when. Main thing I got was a more detailed breakdown of purchase windows for TIFF members, which I know doesn't necessarily help everyone, but the info is there anyway. Note Visa cardholders still get to purchase ticket packages earlier, but the festival now accepts all major credit cards the rest of the time. The person from TIFF wasn't sure, but she thought that it might be the case advance ticketing windows would be from 7:00 AM to 7:00 PM. They are also didn't have any info on what the specific pricing is in the big Flex Pack (e.g. say if you wanted 50 tickets). If you purchase multiple packages, you will still only get one login window for completing your picks (assuming they are all related to the same membership/account). You can have a maximum of 100 package tickets per membership/account, regardless of the combination of packages you might purchase. You can have up to 4 TIFF Choice packages, plus 1 Regular flex pack, plus 1 Premium flex pack per membership/account. So I would take that to mean you could by a 50-ticket Flex Pack and a 6-Premium-Ticket pack, but you couldn't buy a second 6-Premium-Ticket pack as well. I'm not completely sure on this, as the names and definitions of the packages leave this particular policy open to interpretation. The newly renovated Bloor Hot Docs cinema is an official theatre this year. There was a bit of talk as to the possibility that Midnight Madness might not only be in the Ryerson this year, but I don't have any further confirmation on this, or how that would even work. Had a chance to talk to a few other regular festival-goers today, and the general consensus is that everyone is extremely sceptical this new online ordering process is going to work. Obviously we all hope it does work, but we're also expecting the worst to happen. Hopefully we'll be pleasantly surprised. I guess one other additional benefit to the new system will be for out-of-town festival goers who would traditionally have to rely on the courier package which seemed to have its own ups and downs. As I hear more info, I'll continue to post updates. Ticket prices by and large seem to be in line with last year (although see the comments below for discussions on where they do differ); one main area still unclear is the exact pricing for the flex packs; I asked a TIFF staffer, and she didn't know what the exact breakdown would be yet. Will the system actually stand up under the load? Will there end up being a crush of people all trying to log in during the evening because their start times occurred during the day? A number of people seem to be cheering the move online, but I'm not sure their expectations are actually in line with how TIFF implemented the process. As outlined above, there's some pros to this approach, but the whole start time and limited window concept is going to throw people once they actually understand how the process works. I've also seen a few comments, including from TIFF, that people think this online system will eliminate long lines. The old advance ordering process never really had any long lines in terms of getting your schedule or selecting your films or turning in your orders; it was once tickets were selected and exchanges were allowed that lines occurred, but that isn't going to change under the new system. And you're still going to have lines at the box office when individual tickets go on sale; once again, this new system isn't going to solve that problem either. The festival released details on ticketing for the 2012 Toronto International Film Festival. Prices have generally remained steady from previous years back to 2010. Consult my Important Dates page for dates relevant to the ticketing process. Note Visa is the only accepted credit card; otherwise you have to pay by cash or debit card. The old Advance Order Forms have been replaced by an online system. Consult my post here for more details. You will also be able to do advance orders by phone or in person. While people have been clamoring for an online system for years, I'm not sure this is what people were actually expecting. You can now get up to 4 tickets per screening per account/membership for My Choice packages. Previously, many packages limited you to 1 ticket per screening. However, you are allowed only one regular screening flex pack and one premium screening flex pack per account/membership, but I don't have any additional information on what might be covered by that restriction. TIFF Choice packages are limited to 1 ticket per screening, and you can only purchase 4 TIFF Choice packages per account/membership. The Flex Pack has been introduced which allows you to buy 20, 30, 40, 50, 60, 70, 80, 90, or 100 tickets in one go. This is a positive improvement for those people who used multiple 10, 30 or 50 ticket packages in the past. The 6-Premium Ticket Pack has been introduced to allow advance ordering of Premium screenings. A number of other packages have been removed or consolidated. Now, a breakdown of the ticket options for 2012. A comparison with 2010 is provided in brackets for each option where available (I didn't do an explicit breakdown last year). Note if you are a senior or are 25 & under and want to buy at the discounted prices, you will need to show appropriate ID. Prices below also do not include taxes or service fees, which are extra. Single Tickets: can be bought starting September 2. 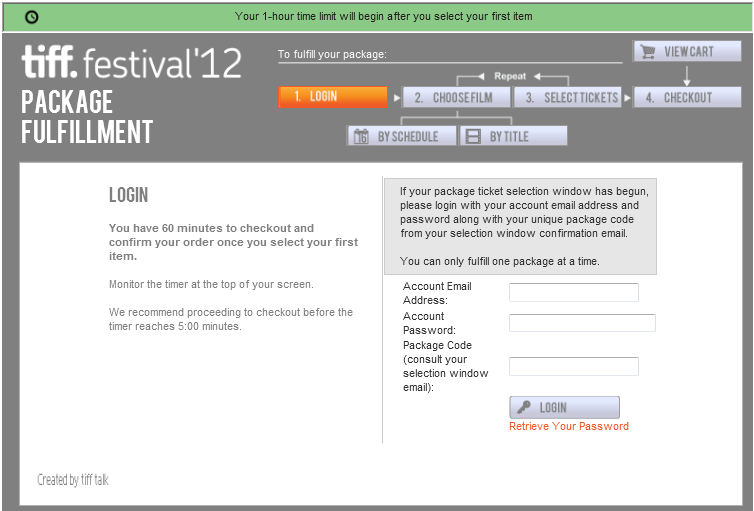 My Choice: you select films prior to the festival starting, following the new advance ordering process. The packages must be bought before late August when the Advance Order procedure starts. 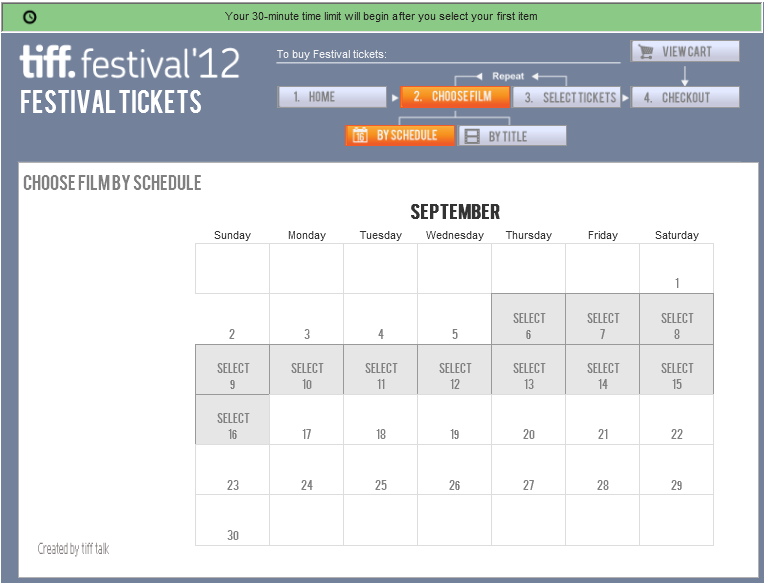 Single tickets can be bought starting September 2, 2012, up until the end of the festival. If a screening is sold out, additional tickets will be released at 7:00 AM the day of the screening, and there is the Rush Line for each film as well. For single tickets, for regular screenings, the cost is $19.69 for adults (no change from 2010), or $17.03 ($0.01 cheaper than in 2010) for seniors, $15.04 for 25 & under, and $12.83 for 12 & under. Note movies may have age restrictions, especially if they are as yet unrated. For single tickets, for premium screenings, the cost is $38.27 for adults (no change from 2010), or $32.08 for seniors (was $19.03 in 2010), $25.00 for 25 & under, and $23.01 for 12 & under. Premium Screenings are indicated as such online and in the Official Film Schedule. Note you are allowed only one regular screening flex pack and one premium screen flex pack per account/membership. Includes Programme Book, Official Film Schedule, sent by FedEx. 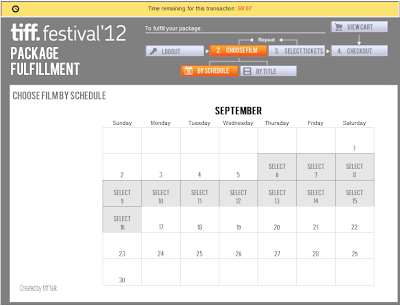 TIFF Choice packages cannot participate in the Advance Order Procedure since films are pre-selected by festival programmers. Note a single purchaser can purchase a maximum of 4 TIFF Choice packages. Each package only provides 1 ticket per screening. 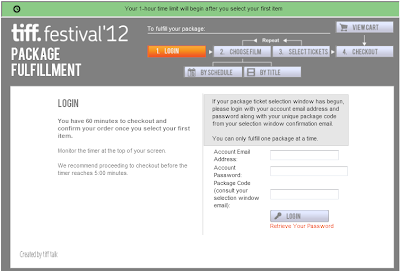 You cannot exchange tickets in a TIFF Choice package for other screenings. There's also a weird disclaimer that English-language films can't be guaranteed for a TIFF Choice package; I think that means you may get a subtitled film (all films are either in English or have English subtitles). If you do buy multiple packages of the same type, note that the films included in each package may differ if you buy them at different times; e.g. if you buy two "The Canadian" packages, but two weeks apart, they may contain different films from one another. 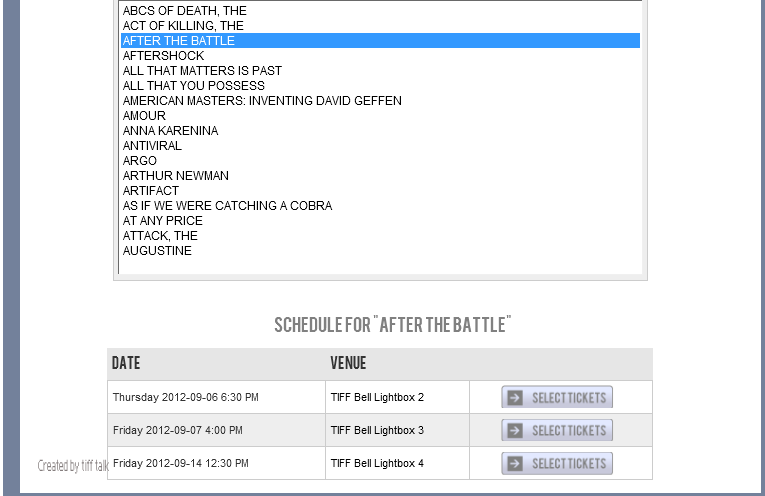 1 ticket to 5 different films by Canadian filmmakers. Big changes are afoot for the advance ticketing process for the 2012 edition of the Toronto International Film Festival. 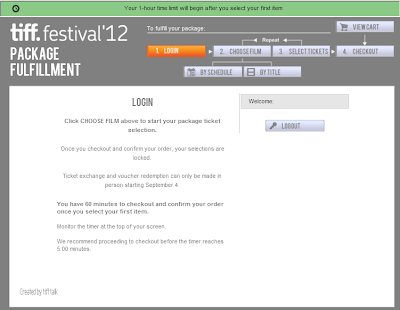 The biggest change is that it appears TIFF is moving to an online selection process for the My Choice ticket packages, as opposed to the paper-based system of years past (it looks like you can also do the ordering process by phone or at the Festival Box Office at 225 King St W). TIFF will randomly assign you a start time over a 4 day-period (August 23 - 26 for TIFF Contributor Members and up, by Member level; or August 26 - 29 for everyone else) if you buy a 10-Ticket Pack, a Flex Pack, and/or a 6-Premium-Ticket Pack. If you buy a Back Half Pack or a 20-Ticket Daytime Pack, selection windows will start on September 3. For the former, once your start time is reached, you have from then until 7:00 PM on August 29, 2012 to make your selections. However, once you enter the system, you only have 1 hour to complete your selections. If you fail to complete your selections within the hour, then anything left in your shopping cart will be released back into the available inventory. If you only make a portion of your selections before checking out, any unused selections will be given back to you as vouchers; it doesn't appear that you can go back into the system multiple times to complete your order - you have one shot to get it right. If you don't log in before 7:00 PM on August 29, you will be locked out until 10:00 AM on September 3. At that point, you have until 7:00 PM on September 5 to make your selections. If you still don't log in after that, you'll get vouchers you'll have to redeem manually. I think most regular festival-goers at this point are wondering how in the world this is going to work given the failure in past years of the box office system to stand up to the load. I'm highly skeptical that even with staggered start windows that there aren't going to be performance issues, especially if people don't start and finish within their original assigned window. Hopefully they've substantially overhauled, upgraded, and tested their systems, otherwise there's likely to be a revolt if the system has problems. Back in 2010, they attempted a shopping cart-type system, but that collapsed under the load and they fell back to their old ticketing page. 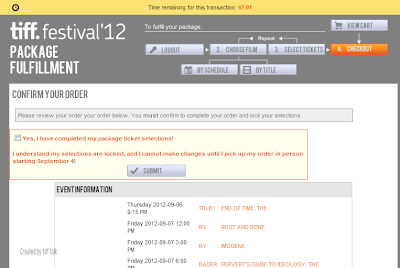 If this doesn't work, I can't see any fallback except huge lineups at the festival box office. Even today, I've gotten Server Too Busy error messages when trying to access the main TIFF site, which does not inspire a whole lot of confidence. Speaking of which, there's no mention of when those selection windows could occur, but I'd guess that they could conceivably fall during the day, when most people may be at work (note they actually have a note on their website that the site has a regular maintenance window from 1:00 to 4:00 AM, so at least your window won't fall into that timeframe). While you aren't required to sign in right at your assigned start time, it doesn't appear there's any benefit to waiting; in fact, you may be penalized if you do so. If you wait several hours, that many more people will have been admitted to the system and snapped up tickets. 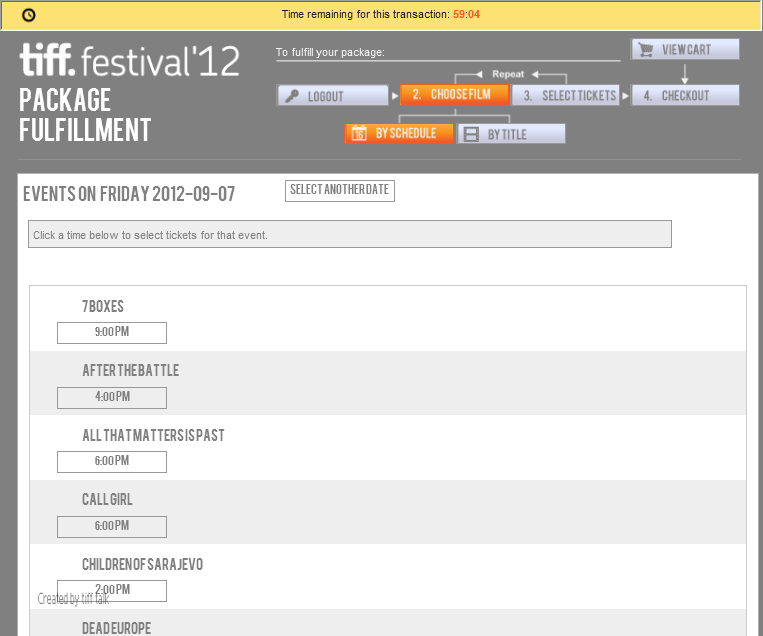 For those familiar with the old system, it's like the Festival is telling you ahead of time what box you'll be in. But if you wait too long, you'll get pushed into later and later boxes. On top of all this, you can now select up to 4 tickets per screening per account, unlike the previous 1 ticket limit for some of the old packages. This would seem to increase the chance of more popular screenings selling out faster. And they've introduced Flex Packs, which allow you to buy 20 to 100 tickets in bulk. I'd love to see the person who is going to complete an online order for 100 tickets in a 1-hour period. If all this works, kudos to the Festival, but nothing in past experience would indicate that this is going to be a walk in the park. The problem is that the people most likely to fill out advance orders are the ones who have been going to the festival the longest, and the ones who are going to be most vocal if problems occur. Potential technical issues notwithstanding, this new process also introduces new problems if your assigned window isn't convenient for you because you're at work or away from a computer or unable to get to the box office. Yes, you still have until August 29 to finish your selections, but by that point everyone else in the system has already made their picks and actually snapped up tickets. Be interesting to see what everyone else's take is on this. Feel free to add your own comments to the post, or any corrections if you see or hear of different info.